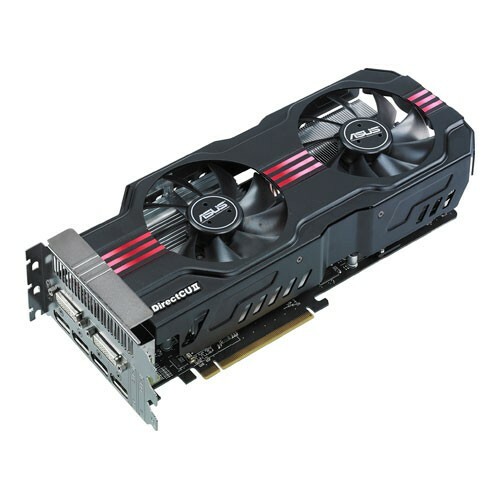 "AMD RADEON HD6950 PCIE* 2.1 2048MB GDDR5 256bit, 810/5000MHz, Dual DVI/4 Display Port, Dual Fan Cooler, DirectCU II, Overclocked Edition, Six Monitor Output, AMD Eyefinity Technology , AMD HD3D™ Technology, Crossfire X "
Super Alloy Power technology uses special alloy formula in critical power delivery components for a 15% performance boost, 35°C cooler operation and 2.5 times longer lifespan. Based on ASUS DirectCU architecture, which uses copper heat pipes in direct contact with the GPU to speed up heat dissipation for over 20% cooler performance, DirectCU II takes cooling further with twin 100mm fans for 600% airflow. Exclusive 6 monitors output via 2 DVI &amp; 4 DisplayPort Output. Factory overclocked to perform at 810MHz, higher than stock performance, resulting in higher frame rates in games.